Who really needs a large SUV these days? That’s the question I attempted to answer this past week with GMC’s Yukon XL Denali. 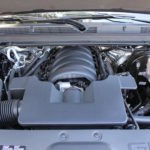 A decade ago, when gas was cheap and crossovers were still in concept stages, large SUVs like The Ford Expedition and Chevrolet Suburban ruled the streets. These days, if consumers have people to haul, they buy a car-based crossover. If they have boats or RVs to haul, they buy a pickup truck. The appeal of plush, full-size SUVs on durable truck platforms has waned, but American automakers are still fighting to keep them relevant. The best chance of success at this stage is with luxurious variants like GMC’s Denali brand and Ford’s Platinum trim. Buyers looking for status symbols are drawn to big, brash, expensive models. 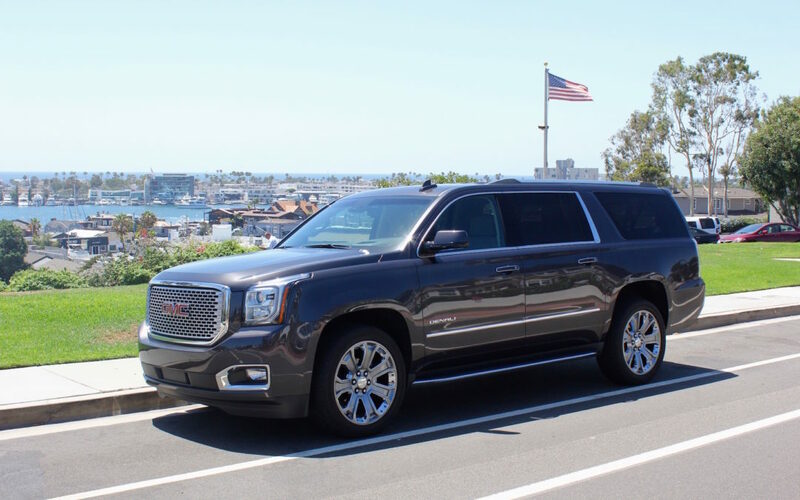 For these consumers, it doesn’t get bolder than the 2016 GMC Yukon XL Denali. 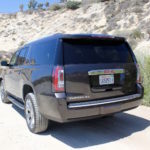 Though there’s been some minor variance over the past few generations, Chevrolet’s Suburban and GMC’s sibling, the Yukon XL has maintained its boxy figure. Aerodynamics be darned, the chunky exterior lends itself to maximum cargo capacity and inoffensive styling. The latest generation truck manages to artfully blend a rugged shape with refined light designs, wheel styles, and trim panels. In Denali trim, GMC goes above and beyond to help the Yukon XL stand out. A large mesh front grille, crisp LED headlights, darkened taillights, and a broader color palette add that premium touch. 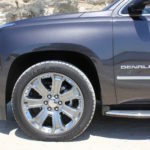 My tester comes equipped with optional Iridium Metallic paint ($395) and 22-inch chrome/painted wheels ($2,495) to amplify the Denali’s luxury presence. While crossovers offer car-like handling and raked rooflines, they simply can’t match the utility potential of a full-size SUV. 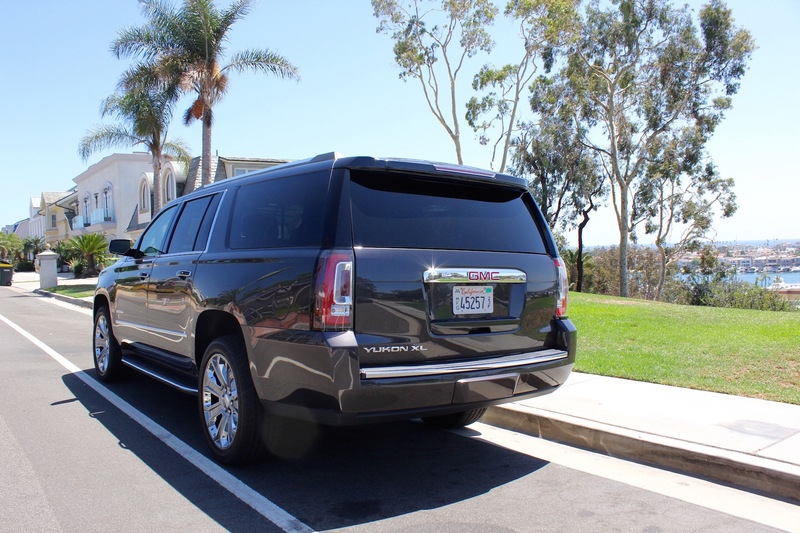 GMC’s Yukon XL Denali boasts 121.1 cubic feet of maximum cargo room, and an ample 39.3 cu. ft. with all three rows of seats in place. 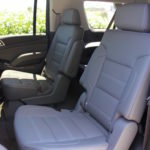 In terms of usability, the Denali comes standard with an automatic folding second and third row of seats, plus a set of buttons to tuck the second row of captain’s chairs forward behind the front seats. Large families or small businesses could use the extensive storage space to transport anything from week’s worth of camping gear to rows of folding tables and chairs. 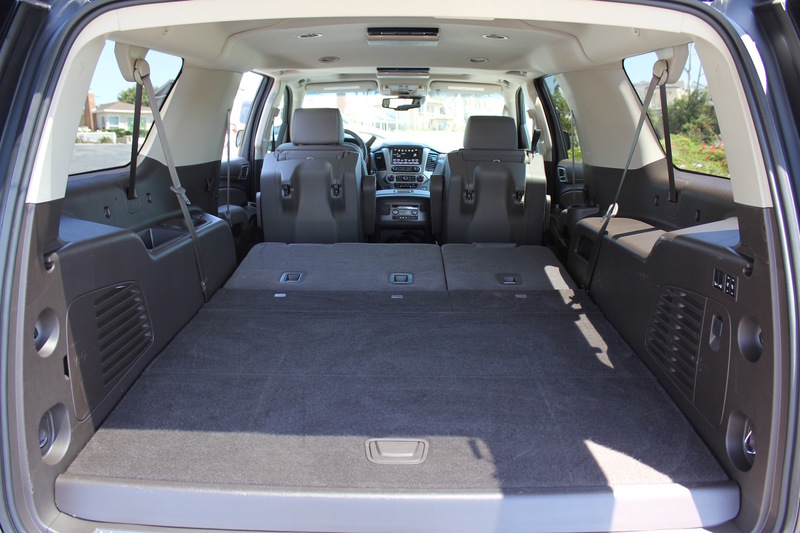 The GMC Yukon XL Denali’s cargo capacity truly is unrivaled. 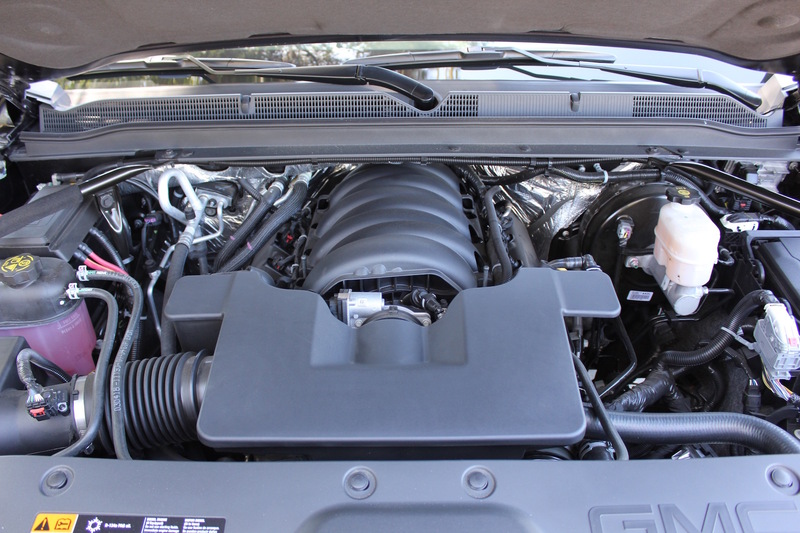 Should you plan to tow a boat, RV, or trailer behind your rig, you’ll be grateful for GMC’s potent 6.2-liter V8 engine. Mated to a new 8-speed automatic transmission, the large displacement motor produces 420 hp and 460 lb-ft of torque. With this much power on hand, the 2WD (two-wheel drive) variant of the Yukon XL Denali can tow up to 8,100 lbs while the 4WD (four-wheel drive) iteration manages 7,900 lbs. Mountains of torque propel the Denali truck to speed smoothly and efficiently, while the 8-speed transmission intuitively selects the proper gear depending on power demands. 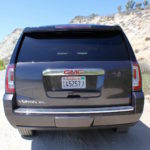 While GM has reserved using its innovative Magnetic Ride Control on performance vehicles to this point, the GMC Yukon XL Denali borrows the adaptive damping system to provide incredible ride quality and cornering stability. These characteristics are nothing short of miraculous in such a heavy SUV, but with dampers reacting to driving behavior in hundreds of a second, it’s no wonder the Denali performs as it does. With quite a bit of distance between occupants and the road, passengers are treated to a smooth ride over even the harshest of surfaces, while the SUV avoids wallowing in corners. Indeed Magnetic Ride Control is so good it makes the Denali’s cabin feel disconnected from the outside world, floating towards the next destination. The real difference between a Denali-badged model and its standard GMC or Chevy counterpart can be traced to its interior. 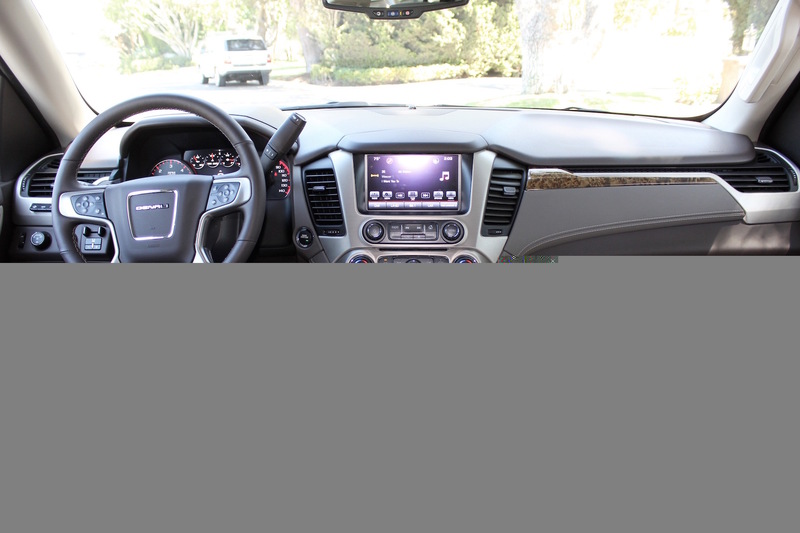 The Yukon XL Denali is coated in soft touch materials, perforated leather, brushed metals, and high quality plastics. There isn’t a hard surface to be found. Supremely comfortable seats complement the Magnetic Ride Control’s damping properties to soften the ride while memory settings for the mirrors, driver’s seat, steering wheel, and pedals add a tailored driving position. Passengers in all three rows enjoy ample legroom and headroom, making the Yukon XL Denali feel more like a mobile living room than a vehicle. 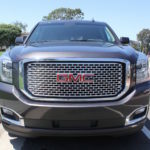 Advanced safety features have trickled through to every corner of GM’s lineup and the GMC Yukon XL Denali boasts a full spread of the latest technologies. Standard features include a segment-first front center air bag to assist front passengers in side impact crashes, blind spot monitoring, lane change alert, rear cross-traffic alert, forward collision alert, lane departure warning, crash imminent braking, and lane keep assist. While each of these features work seamlessly, I find it peculiar that GMC demands an extra $995 for adaptive cruise control – a packaged safety feature in many competing vehicles. That query aside, each feature behaves intelligently and without abrupt acceleration, braking, or steering movements. What’s a premium vehicle without creature comforts? 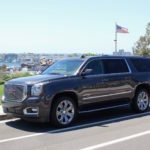 While GMC’s Yukon XL Denali is a step below the Cadillac Escalade on the luxury ladder, it still wields a full range of convenience features. Among its technology highlights are a 10-speaker Bose audio system, HD radio, tri-zone automatic climate control, keyless ignition, heated steering wheel, heated and cooled front seats, heated 2nd row seats, 8-inch Intellilink infotainment system with navigation, OnStar, 4G LTE Wireless hotspot, Apple Carplay, Bluetooth audio streaming, and a digital driver display. Certainly this long list of features is impressive, though GM’s Intellilink system is not without fault. 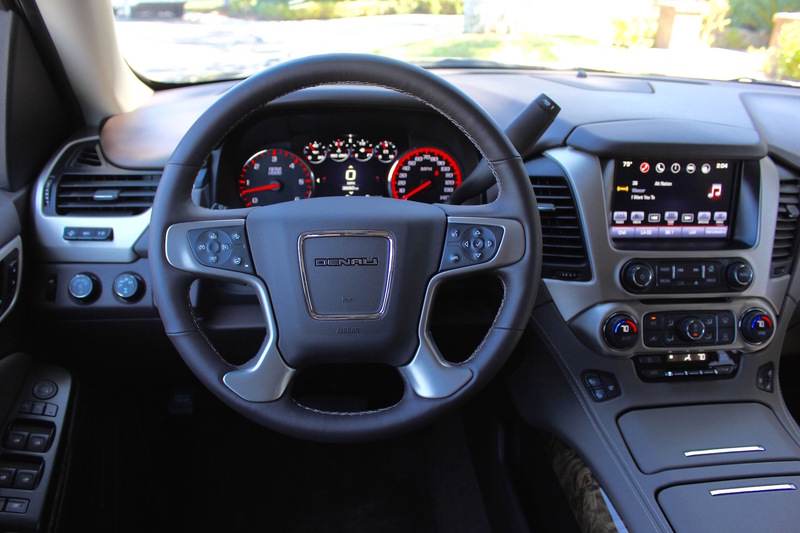 Interaction between the driver display, steering wheel controls, and center-mounted display is disjointed and its Bluetooth phone connection was lost or frozen several times during testing. Though fuel prices are temporarily within reason, filling a 31.5-gallon fuel tank is no fun. GM has attempted to limit your time at the pump, but with a naturally-aspirated V8 on hand, there’s only so much progress to be made. The 2016 GMC Yukon XL uses Active Fuel Management and cylinder deactivation to limit fuel consumption at cruising speeds. As a result, the full-size SUV returns 15 city and 22 highway mpg in 2WD form and 14 city/20 highway mpg in 4WD designation. Though these figures won’t stand to impress crossover shoppers, all but the most lead-foot drivers should achieve 450 miles or more on a full tank of fuel. What started as a complicated question of market positioning has turned into a simple estimation of value. 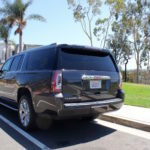 The GMC Yukon XL Denali offers a more comfortable ride, greater cargo capacity, higher towing limits, and a more impressive look than competing full-size crossovers. Unfortunately, its strengths as a smooth, durable, luxurious piece of machinery do yield some competitive weaknesses. Despite GM’s efforts to improve fuel efficiency, an average of 16 mpg in 4WD form is far below the estimates for every crossover on the market. Additionally, the Yukon XL Denali’s size and weight not only make it a challenge to park, but even maneuvering tight streets is an uncomfortable squeeze. Finally, its durable platform comes with a higher price tag. Prices for the 2016 GMC Yukon XL Denali start at $69,220 or $72,220 for the 4WD version, including a destination fee. Add to that options like the 22-inch wheels, Open Road Package (rear seat entertainment screens, a power sunroof, and 9 additional months of XM Radio), Adaptive Cruise Control, and other customized features and the full-size SUV is quickly an $80K proposition. Comparatively, the Lincoln Navigator is priced about $4,000 cheaper and the Infiniti QX80 is $5,000 less expensive. The Yukon XL Denali’s premium price tag comes with more power, utility, and standard features than its main luxury SUV rivals, but new competition is emerging from full-size luxury crossovers like the Ford Explorer Platinum and Buick Enclave. These vehicles can seat the same number of passengers, offer similar amenities, and cost thousands less.